3. blog.nelso.com *Yeah! Corporate blogs work! 7. google.com *Not search traffic. This is traffic from iGoogle and Google Reader. It's interesting to see WikiTravel as the #1 referrer - there is, as far as I know, only one link on that site to nelso.com. It's a link, of course, to the famous Prague Map of Beer Prices. In fact, almost all the traffic from sites #1, #6, #8, #9, and #10 above are links to the beer map (note to self - think of another cool mashup to generate traffic). Not so good is the fact that #9 (travelblog.it) and #10 (diariodelviajero.com) are travel blogs in Italian and Spanish, respectively. Would be great to get them to send users to Nelso Italia and Nelso España instead of sending users to the English-language version of Nelso. I'm not even sure that these blogs know that there are Italian and Spanish versions of the site. Came across a screenshot in Chris Messina's Flickr photostream of Nelso.com's homepage that carries the description "This looks like a parked domain... but it's not!". Not great (that a casual visitor to Nelso.com might think that it's not a real site, but rather one of the spammy sites created just to collect money from Google AdSense). However, it's useful to get this kind of feedback from someone that doesn't know us. I have to admit that the homepage is not very inviting, and we are probably losing visitors that see the homepage and immediately hit the back button. The idea was to make the homepage as clean as possible, but we've probably taken it a bit too far. Time to finally do that site redesign (OK, initial design), and add more content to the homepage. Nelso just completed its first Yahoo! SearchMonkey application, to help enhance Yahoo! results for businesses in the Nelso European database. This application will add phone numbers, addresses, email, and business photos right into your Yahoo! search results, making it easier than ever to find the info you need. You can install the plugin into your Yahoo account by visiting the profile page for Nelso Local Search for Europe on Yahoo!. Try it out and tell us what you think. The 2008 Mercer Quality of living survey is out, and European cities dominate the list. At #1 is Zurich, Switzerland (was also #1 in the 2007 survey), and Geneva, Switzerland is tied for #2 with Vienna, Austria. In fact, speaking German seems to be a good indicator of quality of life. Along with Vienna and Zurich, other primarily-German speaking cities in the top 20 include Dusseldorf, Munich, Frankfurt, Bern, and Berlin. Prague ranks #71 for quality of life, but does considerably better when ranked on personal safety, at #45. As for North America, the list is led by Canadian cities (Vancouver is #4), with the top U.S. city being Honolulu, Hawaii at #28. While doing a search for hotels in Paris on Google Maps, I noticed paid advertisements on the map in the form of custom placemarkers with hotel logos. Obviously, Google is looking to produce more revenue from its very popular mapping service, but I hadn't seen this before. A quick search for hotels in New York shows that this is common across all the Google Maps sites. Nelso uses Google Maps for its search and business detail pages. Will these ads start showing up on our Google Maps when a user searches for a hotel in Copenhagen or Prague? The Google Maps Terms of Service certainly allow for it ("Google reserves the right to include advertising in the maps images provided to You through the Service"), so it's probably only a matter of time. We've recently launched a pre-alpha version of Nelso in Hungarian at nelso.hu. This site contains the same data set as the other Nelso sites, but the translation could use a little work. 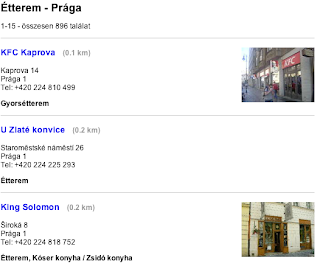 Here's a list of Prague restaurants in Hungarian to kick things off: Étterem Prága.